Top Three Concrete Projects Made with Country Stone WalkMaker ® Forms. New Emergency Response and Training Center Features Intricate Masonry Design. Cash Prizes Awarded for Best Concrete Walkway or Patio Projects. Shotcrete Used to Repurpose Burned Structure as Park Pavilion. Home Projects Council Survey Reveals Surprising Do-It-Yourself Resources. Broadmoor West Finds Beauty in 675,000-pound Coat of Stucco. Energize Sidewalks, Driveways and Patios with Concrete Resurfacer and Stains. 15,000 Square-Feet of Stucco Applied on Largest Public Works Project in Highland Park. The QUIKRETE ® Companies, the leading manufacturer of packaged concrete products for the building and home improvement markets, has been awarded a 2014 Golden Hammer Award in the building materials category from Home Channel News. Licensed Apparel and Merchandise Now Available Online. The American Shotcrete Association (ASA) recently appointed Dennis Bittner, construction products representative for The QUIKRETE ® Companies to its board of directors. Highlights Stains, Coatings, Stuccos and Veneer Stone Mortar. 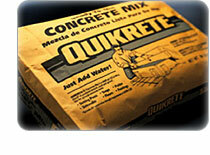 The QUIKRETE ® Companies’ presence at the World of Concrete will be bigger and more dynamic than ever. Survey Finds Homeowners Spending More Time and Money on DIY Outdoor Projects in 2014. Custom Mortar Colors Help Deliver Authenticity with a Modern Twist.